That is just a great idea!! yeah baby! Now tht's using the old noggin!! That is one of the best organizers I have ever seen. I love it. Ooooh! This is a fabulous organizer! That's just terrific. And that's one of my favorite yarn colors, too. Is the cover removable? Once I got a similar organiser as a gift from FGM and I love it! I still have it at hand and I use it every day! I LOVE this. I especially like the part that holds the stitch markers - I am forever losing mine! Great job - I am going to look at the local libraries and see if I can find a copy of this book. Yes, it just slides right over the box. Very cool! What is FGM? This book is wonderful. An excellent book to have on hand. I think I paid about $10 for it new. 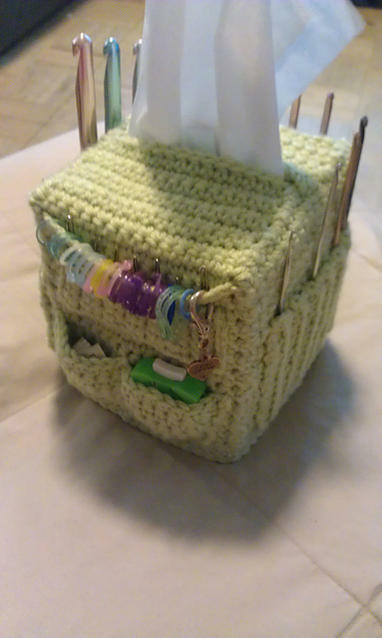 I love the idea of putting scrap into the tissue box after it's empty!! Great idea! That is a box after my own heart. 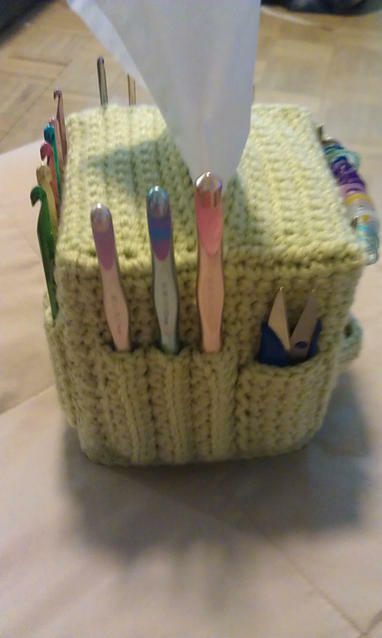 I am always looking for tissues when I am crocheting. That is very cool. pretty and handy. I keep mine in a cosmetic bag.